The two best things to come from Orlando, FL are not Walt Disney World and Sea World. They are Dwight Howard of the Orlando Magic and the Monte Cristo sandwich. Technically neither Howard nor the Monte Cristo is from Orlando. Howard was born in Atlanta, Georgia, and the Monte Cristo has roots in France. But both are currently popular in Orlando, and both are Mmm-mmm good. Dwight Howard: Photo credit Wikipedia. 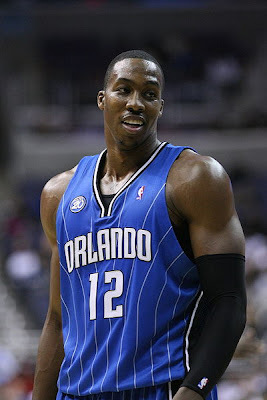 Dwight Howard is the 6 foot 11 inch center of the Orlando Magic who was named the NBA's 2009 Defensive Player of the year. 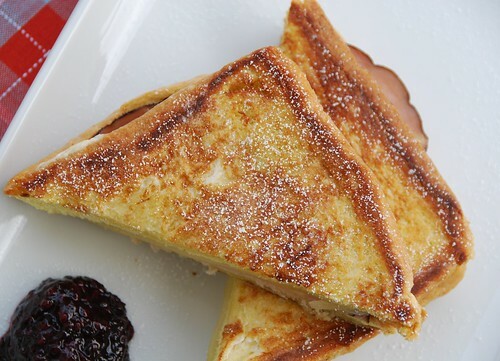 The Monte Cristo is an American version of the Croque-Monsieur, the famed French grilled cheese and ham sandwich that is fried in clarified butter. The sandwich first appeared on the menu at Gordon’s, a restaurant on Wilshire Boulevard in Los Angeles, but it didn't get its big break until Disneyworld got involved. When the Blue Bayou Restaurant in the Pirates of the Caribbean put the Monte Cristo on its menu, its popularity soared. After all this talk about the Monte Cristo, I think I'll be making them for dinner tomorrow night while I watch Dwight play game 4 against the Cleveland Cavaliers. Well, I'm ready to hop a plane to Orlanda, Los Angeles, or San Diego! Love the Monte Cristo! What a pleasant surprise to see a pic of Dwight in your post!! Go Magic!! That sangwich looks mighty fine...fabulous pics..again! Oh yes, Our first taste came from the Blue Bayou and we fell in love instantly! I'll have to try making my own cuz my daughter just loves these. Your pictures are awesome! When you get ready to research the po-boy (surely you plan to include it) you really must talk with someone who remembers their origins, which means a New Orleans old-timer. I would have pegged you as a Celtics fan ;) Love Monte Cristo's! Haven't made them in years, maybe it's time to remedy that. Being on the west coast you get to watch the games at dinner time. Some nights I have to get out the toothpicks to keep my eyes open and pray the games don't go into overtime. I haven't had a monte cristo sandwich in so long... they are so good! I LOVE monte cristo sandwiches! Never heard of this sandwich before but what sounds rather strange to me is the jelly and icing sugar. Powdered sugar notwithstanding, this looks like a quite delicious sandwich! megan-I hope she enjoys them! anonymous-Thank you for the suggestion. I am including it. george-I am a Celtics fa, but they're out, and a girl's gotta root for somebody. Yeah, we on the WC definitely have an advantage. deborah-I'm glad to hear it! ivy-You'd be surprised. It's absolutely delicious. christine-Ha! jeff likes it with extra sugar. Monte Cristo is my husband's speciality. When I get a night off from cooking, that's what he fixes. I've never had one on challah bread - must remedy that immediately! The Monte Cristo looks delicious and the Magic looked pretty good last night too. All the hype about Lebron and the Cavs... looks like they might be eating Monte Cristos on the golf course next week! A sweet and savory sandwich sounds really good. So do you eat it for breakfast or lunch? I discovered Monte Cristos late in life. I remember my college cafeteria served them sometimes and to me they just looked like grilled cheese sandwiches. I didn't get it. Years later I saw them on a menu with a full description of what they were. I tried one and wondered what I had missed out on all of these years! I love them with maple syrup and a fruit salad, but I know a nice restaurant that will also serve them with mornay sauce. Interesting, I've never heard of this sandwich before. I like the idea of sweet and savory! 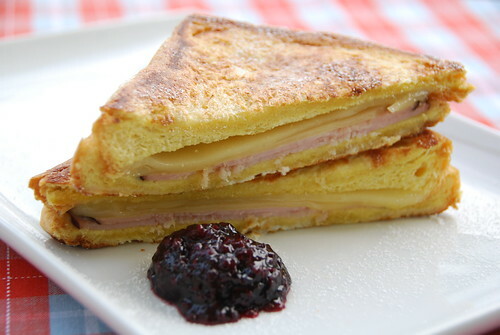 I never would have thought of making a Monte Cristo sandwich at home, but this looks so good I'll have to give it a try. Mmmhhh, that sandwich looks mighty scrumptious! I have memories of the monte cristo sandwich when I was growing up. Interesting how disney put it on the map. Where have I been, you are writing a field guide to sandwiches? Congratulations Susan!! Mmm, I love a good monte cristo! So glad it's popular in your area right now. Basketball and sandwiches...well, they're two of life's greatest things, no?! Delish! Love all the elements of this sandwich. A classic. lynn-That's a great dinner to come home to! joe-I think LeBron is too depressed to play golf yet! sdoc-Done correctly, they're quite memorable indeed. mrsl-Plus, they're easy to make. acaiberry-That's a great idea. Thanks. I consider the Monte Cristo to be the king of sandwiches. In the very early 1970s I discovered it in, of all places, the Holiday Inn restaurant in Cleveland, Mississippi. It has always been hard to find. In the early 1980s I found them on the menu at a resort in the 1,000 Lakes area of New York. Lately, I discovered it on -- and ordered it from -- the menu at our local Chedders. Thanks for the background. owen-Cleveland, Mississippi? Never even heard of it. But apparently they have good taste in sandwiches. Glad you liked the post. I first had a Monte Cristo when I was 9 years old at the Hotel Del Coronado on Coronado Island. My family went back there about every other year until I was 16, and I ALWAYS had the Monte Cristo! It is huge, and delicious. Particularly when eating it poolside exhausted from swimming. You have to try theirs! so good! stacy-I will have to try it. I live about 10 min. from the Hotel Del! I am late in finding your blog, somehow, despite all the food blogs I follow-- it's fabulous-- but I couldn't help but stop to comment on this post. Seeing Dwight's name in the post title and his picture in your post made me grin ear-to-ear. Love that guy. And it's not often that I find other women in the blogosphere that have a soft spot for basketball. So, thanks for the happy moment!